8th Annual Christmas in the Village another big success! Smiles, hugs, laughs, music, food, shopping, and a camel were all in plentiful supply as the Christmas season officially kicked off in North Omaha. Shontel Wells brought her son to Christmas in the Village at 24th and Lake for the first time when he was just three months old. Hearing this is music to the ears of founders Vicki Quaites-Ferris, Director of Operations and Willie Barney, President of the Empowerment Network. The event is now in its eighth year and is achieving what the organizers set out to do. Quaites-Ferris, a native of North Omaha, has an extraordinary passion for making the holiday event a success. 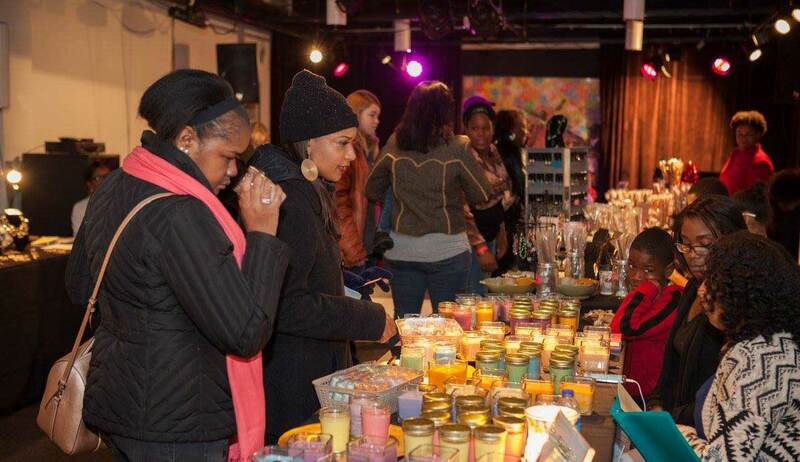 As the lead event manager for the holiday celebration, which now includes over 100 businesses and organizations, she sees the importance of hosting the event at 24th and Lake. In previous years, the event has attracted as many as 5,000 visitors when the weather was over 50 degrees. This year, early morning weather of sleet, rain, and snow had an impact on attendance, but certainly didn’t stop the community from enjoying the activities. Even with the temperature in the 30’s, internal tracking shows thousands of children and families still came out to participate. Most of the activities during Christmas in the Village occurred inside buildings and enclosed, heated tents. Omaha Economic Development Corporation hosted three tents along with Omaha NAACP and the 100 Black Men and gave away free gloves, small gifts, and snacks. Visitors were able to take photos with cartoon characters and watch a community-produced play. The Fair Deal Village Marketplace including Emery’s Café, shops, and the Fair Deal Neighborhood Market celebrated the two year anniversary of its opening with special offers from each store. The event has a very positive impact on the businesses but makes an even greater impression on the kids. They could be seen with big smiles as they completed arts and crafts projects, decorated ornaments and visited the camel and other live animals. They also had their hands full with red bags packed with plenty of free items. Various partners provided free small gifts, toys and books and Christmas in the Village is not complete without free cotton candy, cookies, hot cider, hot cocoa, popcorn and some fruit to balance things out. And, what’s a holiday event without a visit to see Santa? “It’s awesome,” said one young visitor, as she pointed out all of the goodies in her bag including slime, small gifts, and large toys. Parents, family and community members also enjoyed the free carriage rides, free family photos, the holiday concert with some local gospel and jazz artists, food from mobile food trucks and valuable information provided by community organizations. 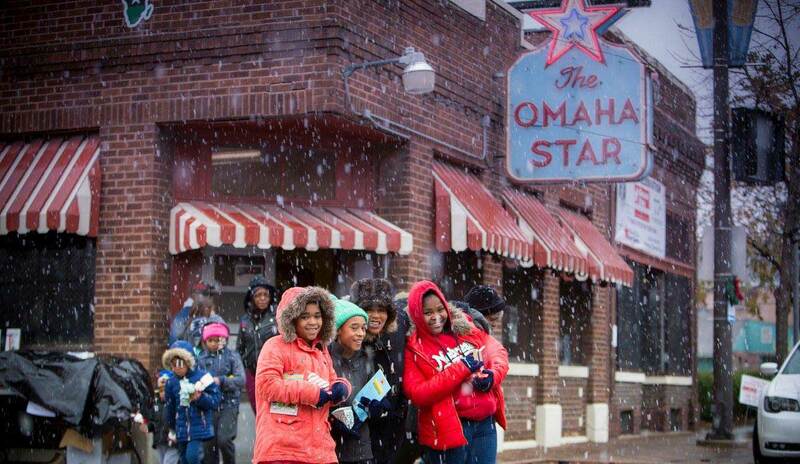 They also had the opportunity to learn about North Omaha history at the Great Plains Black History Museum and win a 32-inch television from Styles of Evolution. This year’s event was even larger with the Mobile Game Truck sponsored by the Sno Cooler, balloon artists, community expo, merchant sale, cartoon characters, sponsored activities including an ornament decorating station, antler ears and more. The event attracts people from across the region, including elected officials, civic leaders, neighborhood residents, and school children. Councilman Ben Gray, Commissioner Chris Rodgers, Superintendent Cheryl Logan, pastors and faith leaders, neighborhood associations, principals, business executives, and law enforcement were actively engaged in the festivities and interacted with children and their families. As more families like the Wells family have positive experiences at 24th and Lake, it builds excitement and shows what’s possible in the area. Christmas in the Village is helping to accelerate the momentum building along the North 24th Street Corridor. While the organizers are focused on the next event, children left Christmas in the Village full with snacks, gifts, and memories which will last a lifetime. Christmas in the Village at 24th and Lake is presented by the Empowerment Network, Omaha Economic Development Corporation, and 100+ businesses and organizations. The event is sponsored in part by American National Bank, Nebraska Arts Council, Revive! Omaha Magazine, Veridian Credit Union and media sponsor, KETV.